Bethel New Life hosted a series of Mother's Day appreciation events for all the mothers in its senior housing facilities. The activities began with a professional photo shoot where the mothers took new photos that they could share with their families. They were also able to get their nails painted and decorated. On the Friday before the holiday, a pizza party and prize raffle was held. On May 11, the family of the late Pastor Waddell visited and provided lunch. All the mothers received roses on Mother's Day and were also treated to a spa day with foot and back massages. For more information on Bethel'	s Senior Housing programs, please, click here. Bethel partners with a number of financial institutions to host monthly homeownership counseling workshops at locations all around the West Side. General workshops provide a full day of information that potential homebuyers need to know before considering the purchase of a home. Bethel also hosts targeted homeownership workshops that focus on one key topic, such as tenant's rights. Assuring that community residents have access to affordable housing alternatives has long been core to Bethel's community investments. So far, Bethel has hosted 5 sessions in 2015 and each session has resulted in a new home being purchased. To learn more about Bethel's Homeownership Counseling program, click here. On May 14, Lisa Walker from Bethel's Financial Literacy program was one of seven participants in a roundtable on student loan debt with the Consumer Financial Protection Bureau at an event hosted by the Woodstock Institute. The Woodstock Institute is a leading nonprofit research and policy organization in the areas of fair lending, wealth creation, and financial systems reform. It works locally and nationally to create a financial system in which lower-wealth persons and communities of color can safely borrow, save, and build wealth so that they can achieve economic security and community prosperity. On April 30, Bethel New Life and BLUE|1647 hosted a "Technology Innovation Day" featuring a day-long series of interactive learning sessions and activities designed to expose residents of Chicago's West Side to opportunities in technology, advanced manufacturing, 3D printing and mobile application development. The event also served as a staging ground for establishing teams for the 2015 Center for Neighborhood Technology Urban (CNT) Sustainability Apps Competition. The event was attended by around 60 participants from local school children to entrepreneurs and individuals interested in technology. Youth participants were able to learn about 3D printing technology by scanning and creating 3D printed images of themselves. 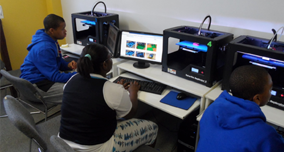 Students from John Hay Elementary School learn about 3D printing. A town hall session on the CNT sponsored "hack-a-thon" was held where community members identified problems that could be addressed by developing a mobile application. There was also an open house session where attendees were able to explore a mobile science lab and examine additional aspects of information technology, 3D printing and advanced manufacturing. For more information on Bethel's partnership with BLUE|1647, click here. Are you interested in donating to the Entrepreneurship Training Program (ETP)? 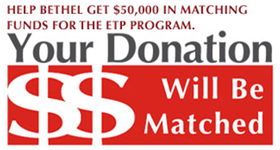 Bethel New Life has a tremendous opportunity to have up to $50,000 in donations to the ETP matched by one of our generous donors. Help us reach this number and raise $100,000 to support emerging entrepreneurs on Chicago's West Side.